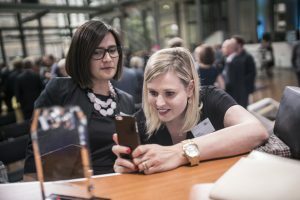 Germany – October 11, 2016 – B&B HOTELS GmbH, a leader in the market for economy hotels, was awarded the 2016 Digital Champions Award in the “digitalization of guest experience” category for their innovative online check-in system that works entirely with guests’ smart phones and devices. This advanced, award-winning solution was created and implemented by Ariane Systems, a recognized leader in self-service check-in/out systems for the global hotel industry. The digital check-in solution at B&B HOTELS was first implemented portfolio-wide in June 2014 and has been well received by the chain’s diverse, tech-savvy clientele. B&B HOTELS, one of Germany’s first hotel brands to offer a fully automated online check-in option, currently has 80+ locations across the country. The hotel brand has successfully used Ariane’s advanced kiosk check-in solution for more than eight years, with the addition in 2014 of online check-in through the company’s cloud based Allegro Web & Mobile platform. This system allows guests to book online, pay online and gain immediate access to their rooms, without having to wait in a queue at reception upon arrival. Through the Allegro Web & Mobile system, Ariane’s digital self-service solution sends guests an invitation to check-in online 48 hours prior to their arrival, where they can also review their contact details and make payments through SIX Card. This service automatically checks guests in beginning at 2 p.m. on their specific arrival date. Guests using online check-in will receive SMS and email messages with their room number and access code. 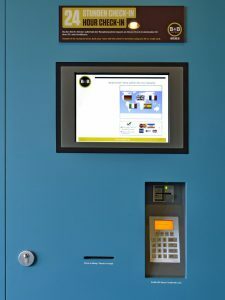 Guests can also choose to complete their check-in using a self-service kiosk in the lobby and receive the pin-code for room access, and can completely bypass check-in at reception for more efficiency and convenience. Ariane Systems’ self-service check-in solutions continuously provide hotel guests around the world with instant access and the ease of use that today’s tech-savvy travelers crave. For more information on Ariane Systems, please visit www.ariane.com. About Ariane Systems | Ariane Systems is the world’s leading provider of self-check-in/check-out technology solutions for the hospitality industry. Founded in 2001 by Michel Lavandier and Laurent Cardot, Ariane now has more than 3,000 installations running at hotel properties in over 25 countries. Numerous hotel chains utilize Ariane’s electronic kiosk, mobile and web solutions to streamline the check-in/out process. These include B&B Hotels, Lindner Hotels, Choice, Scandic, Hyatt, MGM, Mövenpick, Park Inn, Radisson Blu, and Louvre Hotels, among others. With corporate headquarters based in Paris, France, Ariane Systems maintains regional offices in North America, UK, Germany, Spain, Benelux and Scandinavia. For more information, please visit www.ariane.com.